Ford Muscle Forums : Ford Muscle Cars Tech Forum > Vendors > CARiD.com > Get your money back with Corsa - New Mail-in Rebate Promo! Get your money back with Corsa - New Mail-in Rebate Promo! Let your Ford Mustang be heard long before being seen by installing Corsa headers or performance exhausts! 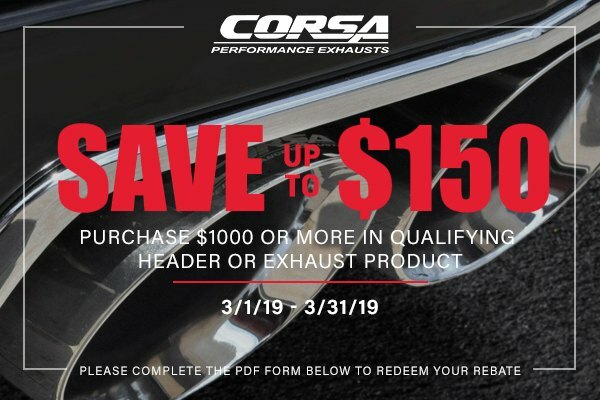 Receive up to $150 mail-in rebate for qualifying Corsa Headers or Exhausts valued at $1000 or higher. The offer is valid till March 31, 2019. Please fill in the following PDF form to get your rebate. If your goal is to get excellent performance and head-turning sound - Corsa is the number-one choice. Their products are manufactured from premium grade 304 stainless steel tubing for improved exhaust flow and excellent corrosion resistance. On top of that, they reduce back-pressure thanks to high-flow multi-core mufflers and large diameter tubing. A simple addition like Corsa header or exhaust system can significantly change the performance and sound of your Mustang and take your driving experience to the whole new level! Last edited by carid; 03-14-2019 at 06:32 AM.